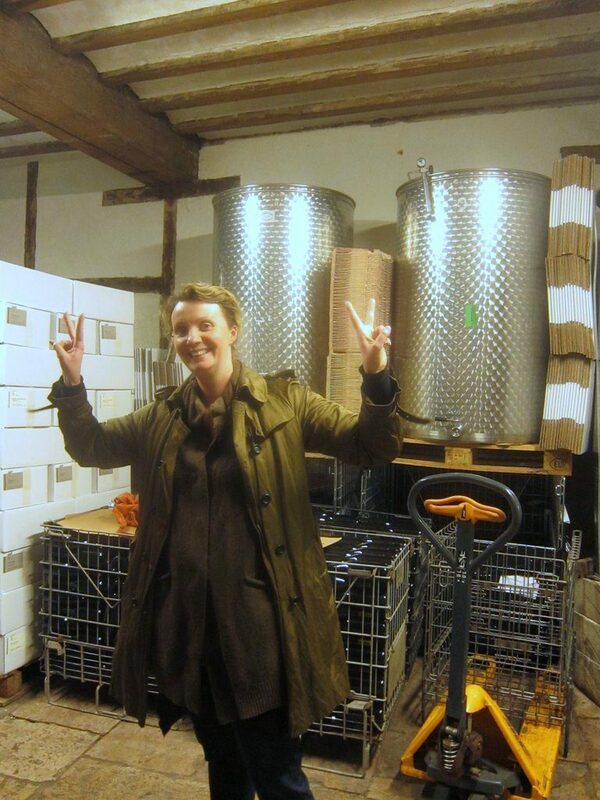 Fanny Sabre has established herself as a leading producer of quality natural Burgundy wines. She is only in her early thirties, but she has very good vines in some great appellations surrounding the ancient city of Beaune as well as a few plots in Pommard, Volnay and Meursault. Her cellar is in the small town of Pommard where she also runs a delightful cafe. She is producing a range of wines in small quantities that are snapped up by the natural wine bars proliferating in Paris and New York. We have been working with Fanny for a number of years now and are delighted with the delicate perfection of her wines which are made with as little intervention as possible. 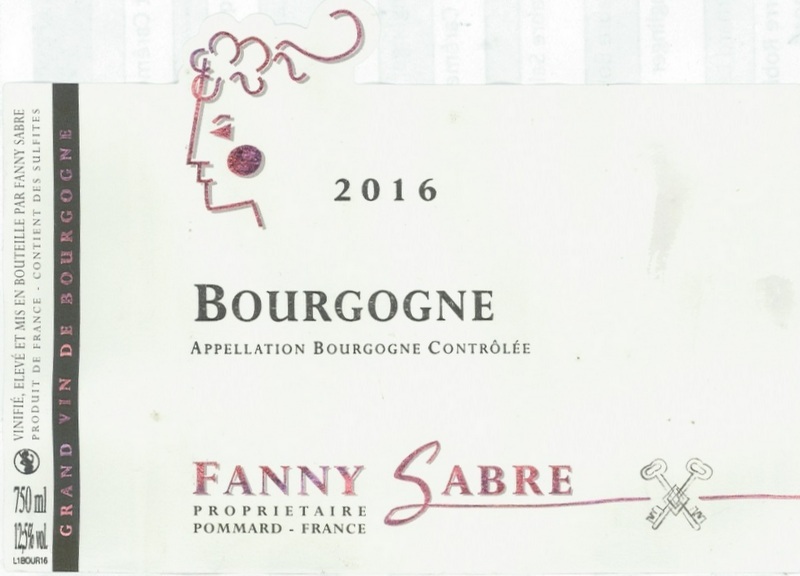 The grapes for the Fanny Sabre Bourgogne Rouge are sourced from a number of her plots around the historic town of Beaune therefore it cannot be labelled with a specific vineyard or appellation. Rather it is labelled with the more generic Bourgogne Rouge appellation. We always love Fanny’s Bourgogne wines and this year is no exception. It is made from 100% Pinot Noir and the resulting wine is both expressive and lively with spicy red fruit notes with excellent underlying structure and well worth the asking price. The Fanny Sabre Bourgogne Blanc is always a hot favourite. It is made from 100% Chardonnay sourced from her vineyards around the city of Beaune. The wine has been raised in tanks and has had no additions – she simply allows her wines to ferment using the natural yeasts in order to provide additional complexity. Old barrels are used to mature the wine. It is an elegant, flavour-packed wine (think white fruits) which has seen no new oak. It lingers on the palate and matches beautifully with a range of foods. The elegance of this vintage belies its humble Bourgogne appellation. This is great drinking at this price. Apéro chic, bien sûr! – A chic aperitif, of course! Fanny Sabre shows a fine touch with her Aligote. Aligote is the wine that the locals drink in Burgundy. It is gradually emerging as an interesting wine in its own right rather than playing second fiddle to Chardonnay as more talented winemakers such as Fanny show what can be achieved with this grape. It is not only the winemaking in this case but also the terroir because Fanny’s late father used up some of his precious land in Pommard to plant the Aligoté vines. This is a beautiful wine with great complexity, depth and beautiful structure. At a recent tasting everyone was blown away by it and kept returning to it to work out what was making it so appealing. The minerality and the complexity creeps up on you slowly. It has a lovely streak of acidity, lots of white fruit nuances, generous mouthfeel, lots going on at the end of the palate and amazing texture as well. 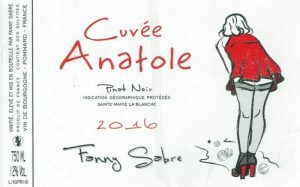 This is the first year that Fanny has released a wine from this appellation. The village of Sainte Marie La Blanche lies on the eastern side of the A6 freeway to Pommard and shares some of the iron rich soil that makes Pommard wines so attractive although here it is more clay and sand from the Pliocene era. In this IGP it is possible to make wines with a mix of Gamay, Pinot Gris and Pinot Noir, however, this red is made from 100% Pinot Noir and shares some of the characteristics of a Pommard but at half the price! It is named after Fanny’s youngest son, Anatole who was born just after the 2016 vintage was complete. This 100% Chardonnay is from the Savigny-lés-Beaune appellation just north west of the very old town of Beaune in Burgundy. Whites from this appellation are relatively rare as only small quantities are produced. Fanny Sabre makes all her wines using natural methods. No filtering (there is some sediment in the wine) as she believes that this strips out the flavour, no fining, no commercial yeasts to control the fermentation and no poisonous sprays in the vineyard. The care that she takes shines through in the wines. Complex nutty nose with notes of apple, pear and meal. The palate is fresh and slightly oxidative with lively mineral notes as well as nuts and apples. Distinctive: really lively and multidimensional. This white wine is produced from vineyards in the northern section of the Côte de Beaune that lies to the north of the city of Beaune. The area sees some beautifully elegant wines produced and this one is no exception. This is the first time we have imported a wine from Fanny that has been produced in this appellation. Saint-Romain is a small village in the Côte de Beaune region of Burgundy which lies about 12 kilometres south west of the city of Beaune. The appellation is very close to Pommard, Volnay, Monthelie and Meursault and this is why Fanny has aquired a small vineyard in this area as it is perfect for the production of interesting white wines. Chardonnay thirves here of the marl and limestone clays which provide a distinct minerality to the wines. This wines is a real treat. If you haven’t tried a Saint-Roamin before here is a chance to sample one of the best. This 100% Pinot Noir is from the Savigny-lés-Beaune appellation just north west of the very old town of Beaune in Burgundy. Red wines are the main variety in this appellation as whites are only produced in small quantities. Fanny Sabre makes all her wines using natural methods. No filtering (there is some sediment in the wine) as she believes that this strips out the flavour, no fining, no commercial yeasts to control the fermentation and no poisonous sprays in the vineyard. The care that she takes shines through in the wines. Lovely pale red colour. Distinctive reductive matchstick nose with complex red cherry fruit and some smoky, spiciness. The palate is lively and precise with a reductive twist and grippy tannins. Very fresh cherry fruit. Lovely. This beautiful white is made from 100% Chardonnay using grapes sourced from her vineyards around the city of Beaune. This Chardonnay is fresh, lively, creamy, vibrant and a beautiful expression of the Beaune terroir. It is a perfect food wine and would work beautifully with a range of dishes including charcuterie, roast chicken, Comte cheese and jack mackerel. This wine would give many of the premier crus from this area a run for their money! This beautiful red is made from 100% Pinot noir using manually harvested grapes sourced from her vineyards around the city of Beaune. Fanny has vineyards in between Beaune and Pommard in both the Beaune appellation and the Beaune Premier Cru area where she sources the grapes for her delightful Chouacheux. The vines in this area benefit from the calcareous marl soils that are the source of the power and elegance of her Pommard wines. The grapes undergo semi-carbonic maceration before going into old barrels for at least 12 months. Fanny does not rack or fine this wine. Prior to bottling she transfers the wine from the barrels to a stainless steel tank to settle for a few months before bottling. This Pinot is soft, fresh, textured, elegant and pretty. The Fanny Sabre Clos des Renardes is a new vineyard that Fanny has acquired in this very good terroir. It is made from 100% Pinot Noir and the wine benefits from clay and limestone soils found in this vineyard. Fanny macerated the juice in stainless steel for 5 days and then transferred the juice to old barrels for fermentation for 15 days and then maturation for 12 months. This is a beautiful, elegant wine that is drinking nicely now but which will benefit from a year or two in the cellar. There is also a dramatic new label for this wine! Obviously, the vineyards that Fanny maintains in the Hautes-Côtes de Beaune are at a higher altitude than her standard Beaune vineyards, therefore they benefit from the cooler climate in this area. The vines here have very low yields so Fanny is able to make concentrated wines from the concentrated flavours developed in the fruit. Harvesting is always manual and the grapes are placed in small crates so the fruit is not damaged. The grapes are taken to her winery just near the centre of Pommard where the juice is placed in old barrels for up to twelve months before resting in stainless steel tanks prior to bottling. This is a lovely, complex wine with great minerality and black and red fruit aromas and very fine tannins. People are definitely starting to take notice of Monthélie as am emerging appellation! If you drive south out of Beaune on the D973 you very soon pass through the famous wine villages of Pommard and Volnay and then arrive at Meursault on the left side of the road and Monthélie on the right. The Monthélie vineyards are, in fact, very close to some of the finest vineyards of Volnay! It is definitely an appellation to watch. The soils are excellent, the exposure good and the proximity to the other fine appellations means that great wines are possible here. This wine is an intriguing one for us. It displays some of the strength of close-by Volnay and some of the structure of Pommard, but it an energetic, lively yet elegant wine displaying characteristics found only in Monthélie. “les tanins finement ciselés apportent ce qu’il faut de structure sans oblitérer la pureté du jus. Et c’est là que l’on reconnait le travail naturel de Fanny. the finely crafted tannins bring structure without obliterating the purity of the juice. And this is where we recognize the natural work of Fanny. The fruit is respected – baked cherry –, the aromas – peony, dried petals, oriental spices -, respectable roundness and corresponding firmness. What mastery, Madame!! Fanny Sabre has a number of plots dispersed throughout Pommard and this one is made from the highly regarded Les Charmots lieu dit (plot of land) which has Premier Cru status. Here the famous marl-based soils give their calcareous minerals to the vines to create wines of power and structure. This appellation is known for strong, austere Pinot Noir wines that take a while to reveal their best side. This is a very interesting wine that is lively on the palate and has a long finish. It needs to be decanted for an hour or so prior to drinking. Fanny Sabre has a number of plots dispersed throughout Pommard and this wine comes from a plot of very old vines. This appellation is known for strong, austere Pinot Noir wines that take a while to reveal their best side, however the 2017 is a very good wine with lots of structure that is drinking well now. The combination of the very old vines and the complex marl soils that combine mudstone and calcium carbonate minerality help to provide the structure and complexity present in this wine. As with the Premier Cru Pommard above this is a very interesting wine that is lively on the palate and has a long finish. It needs to be decanted for an hour or so prior to drinking. We only have a tiny allocation of this wine so we expect it to sell out quickly. We very much enjoyed tasting this Volnay in Fanny’s cellars on our most recent visit. This wine is made from 100% Pinot Noir. It has been a harrowing few years for Fanny as hail has wiped out her vineyards in Volnay and Pommard for the last few years. However in 2015 she was again able to harvest enough grapes to make a Volnay wine! The colour is light, the palate shows finesse allied with depth of flavour. It caresses the palate and lingers with the promise of further delights from the next sip. A beautiful wine. The vintage of 2014 were really, really low yielding and the vintage of 2015 was richer from the higher temperatures experienced that year. There was so little wine in 2014 that Fanny did not have enough juice to separately vinify the grapes from Chouacheux, the Vignes Franches and the Les Sceaux premiere cru plots that she has in the Beaune appellation. Instead this is a blend from those three areas. The good news is that the result is very good indeed in both vintages. Typical Fanny Sabre – the wines are delicate and elegant while having an underlying power and structure that is very appealing. The Beaune Premier Cru Chouacheux is Fanny Sabre’s premium wine from a well-known ‘climat’ in the Beaune Premier Cru appellation. The climat is very close to Pommard and shares very similar soil. It is made from 100% Pinot Noir. The first thing that you will notice about this wine is how fresh it tastes. It is alive and also has a great mouth feel. The taste lingers and promises even more with some age. A great example of a Beaune from a great climat. We only have a very small allocation of this wine so we expect it to sell out quickly. 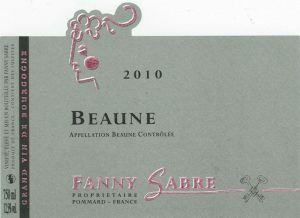 The Beaune Premier Cru Vignes Franches is another of Fanny Sabre’s premium wines from the Beaune Premier Cru appellation. She doesn’t release this wine until it is ready! It is made from 100% Pinot Noir. As with the Chouacheux it is a lively, fresh, light-bodied, intense, velvety Pinot Noir of considerable elegance and depth of flavour. The taste lingers and promises even more with some age. The Beaune Premier Cru Les Sceaux is another of Fanny Sabre’s premium wines from the Beaune Premier Cru appellation. Les Sceaux is a lieu dit within the broader Beaune appellation and the wines made from the vines in this plot are considered of such quality as to deserve the Premier Cru status. It is made from 100% Pinot Noir. As with the Chouacheux it is a lively, fresh, velvety Pinot Noir of considerable elegance. Sous La Velle is a special plot within the famous Meursault appellation. It is made from 100% Chardonnay. It is drinking nicely now but will also acquire additional grace with time. When we tasted this wine in Fanny’s cellar in Beaune we were dazzled by its sheer elegance. Normally during a wine tasting we are very disciplined about spitting out the wine – there was no way we were going to do this with the Charmes! It is made from 100% Chardonnay. It is drinking nicely now but will also acquire additional grace with time. The Aloxe Corton appellation is known for its age-worthy red wines and mouth-filling white wines. Sitting just below the iconic hill just north of Beaune, this appellation shares much of the same terroir as its more famous cousin. This wine offers plenty. We get hints of plum and flowers and, like all of Fanny’s wines the mouthfeel is very pleasant and the finish is long. This is another well-balanced, light, delicate and perfectly balanced wine that will be delightful drinking for the next five years.